Professor Albert H. Munsell, an artist and art teacher, developed the basic principles of his color order system mainly for the purpose of bringing order to the study of color. Munsell wanted the study of color to be similar to the study of music, which had order so that one could “hear” how a composition would sound by reading the notes. Likewise, Munsell wanted one to “see” color based on its three-dimensional attributes of hue, value and chroma. Munsell’s discovery of the three-dimensional aspect of color offered the order Munsell was looking for not only in terms of each individual color, but also each color’s relationship to other colors. He published the basic principles of the color order system in his 1905 book, A Color Notation. In 1915, he published The Munsell Atlas of Color, which was the predecessor to today’s Munsell Books of Color. The color atlas displayed colored specimens of a range of values and chromas for ten hues. In 1918, A.H. Munsell formed the Munsell Color Company to produce color standards. Sadly, he died the same year. His son, Alexander Ector Orr Munsell (A.E.O. Munsell) sponsored studies at the National Bureau of Standards and in the Munsell Color Laboratory, which led to the improved color scales in the 1929 edition of The Munsell Book of Color, which displayed 20 hues. A subcommittee for the Optical Society of America studied the visual spacing of the scales and published recommended changes in 1943. Those recommendations are called the Munsell renotations. The recommended spacing was specified by the system of color measurement standardized by the International Commission on Illumination (identified by the initials, CIE, of its name in French), using CIE Illuminate C and CIE 1931 (2 degrees) Standard Observer. The renotations provide a method of converting color measurement data to Munsell notations and the specifications for producing Munsell color standards. The Munsell renotations were standardized by the American Society for Testing and Material in D 1535 Standard Test Method for Specifying Color by the Munsell system. Around 1950, the number of hues in The Munsell Book of Color were doubled, from 20 to 40 hues. In the early editions of The Munsell Book of Color, the chips had a matte surface. In 1958, a glossy version was introduced, to improve the reliability of comparisons of the standards to paints, plastics and other materials with glossy surfaces. Both matte and glossy versions are in widespread use today. The Nearly Neutrals Collection, introduced in 1990, provides a number of pale colors often used for cosmetics, interior design and computer hardware. The Munsell color-order system has gained international acceptance. It is described in unabridged dictionaries and encyclopedias as well as in specialized publications on art, design, color photography, television, printing, paint, textiles and plastics. It is recognized as a standard system of color specification in standard Z138.2 of the American National Standards Institute, Japanese Industrial Standard for Color JIS Z 8721, the German Standard Color System, DIN 6164 and several British national standards. The Munsell color-order system has been widely used in many fields of color science, most notably as a model of uniformity for colorimetric spaces and has, itself, been the subject of many scientific studies. 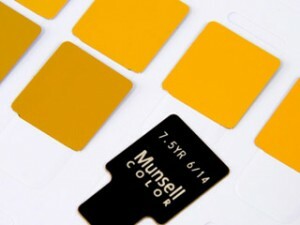 Thanks to Munsell’s Color Order System, communicating color is easier and more accurate. Keep Munsell Books of Color handy for quickly locating the color you want.